In addition to receiving high marks on performance and capability, the new Ford Flex is getting a lot of buzz right now for how convenient it is for both drivers and passengers. This SUV makes your daily commute or weekend family road trip something that you can look forward to. 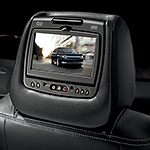 The voice recognition technology and push-to-start features allow you to get going in the Ford Flex without any delay. You can also quickly load up this SUV using the foot-activated back door option so that you do not need to fish around for keys. Never spill a drink again with the 10 cup holders throughout the Ford Flex. You can rest assured that you will get to your final destination without getting lost or tacking the traffic-logged route thanks to the SiriusXM navigation available. See how the Ford Flex makes driving better than ever at Hempstead Ford Lincoln today.